The daily business newspaper Kommersant has been following the EU summit in Brussels, at which one of the key issues has been the Ukrainian crisis and EU policy towards Russia. Even before the meeting it was clear that it would be impossible for the EU to reach a consensus on the extension of sanctions against Russia: While the UK, Poland and the Baltic countries spoke out in favor of expanding the restrictive measures, Spain, Italy, Hungary, Slovakia, Greece and Cyprus declared their opposition to such a move. For this reason, neither the tightening nor the relaxation of the sanctions were on the agenda. 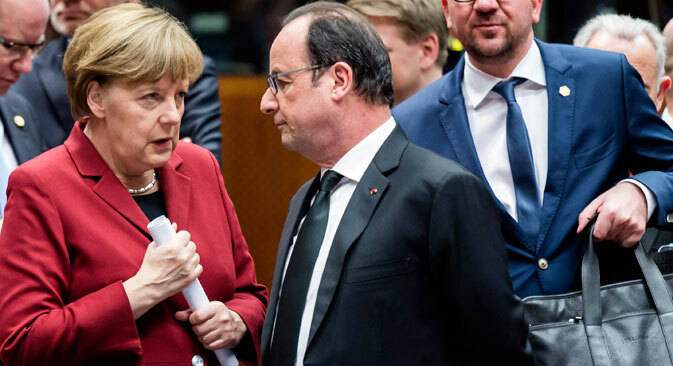 However, a number of EU leaders have backed the idea of tying the sanctions to the complete implementation of the Minsk Agreements on the settlement of the conflict in the Donbass region of eastern Ukraine. "One of the best ways to support Ukraine will be to maintain the pressure of sanctions on Russia until we see the full implementation of the Minsk Agreements," Kommersant cites President of the EU Council Donald Tusk as saying. A Kommersant source close to EU structures explained that the decision deals with the complete realization of the Minsk Agreements and that sanctions will not be relaxed as the agreements are being realized phase by phase. The newspaper concludes that this essentially means that the sanctions will persist until the end of the year. The centrist newspaper Nezavisimaya Gazeta writes that, according to the results of the last survey carried out by the Kiev International Institute of Sociology, the Donbass is the only region where supporters of the Eurasian Customs Union [of Russia, Belarus and Kazakhstan – RBTH] outnumbers those oriented toward European integration. This may mean that even after the complete cessation of military activity the Donbass will be ready to reintegrate with Ukraine only on its own conditions. The newspaper reports that on the whole the number of Ukrainians supporting the country's potential future entry into the EU is 47.2 percent, while the number of supporters of integration to the Eurasian Customs Union is 12.3 percent (before the Maidan uprising of a year ago it was 41 and 35 percent, respectively). The number of citizens who prefer neutrality has increased from 9 percent on the eve of the Maidan to 27 percent now. Experts believe that this is the most important indicator, since it shows that while Ukrainians fear Russia, they also do not trust the EU, whose help they had previously hoped for. Nezavisimaya Gazeta says that political announcements about the concerns of EU leaders are accompanied by a readiness to betray Ukraine's interests for the sake of personal ones, which is the reason for the disillusionment in Ukrainian society. The Vedomosti business daily writes that the popularity rating of the Brazilian President Dilma Rousseff has dropped sharply following mass protests. According to a survey carried out by Datafolha, the Brazilian Institute of Public Opinion, Rousseff's rating as "horrible" rose from 18 percent last month to 62 percent today. Nevertheless, Rousseff will most likely remain head of the government. According to Brazilian law, the president can be impeached only if he or she violates the law during the presidential mandate. Therefore, since Dilma Rousseff collaborated with Petrobras in 2003-2005, before becoming president, accusations may be brought against her only after her mandate, writes Vedomosti.